Liberalism produced some of the greatest political advances of our age. As socialists we often obscure this, but civil and political rights combined with representative democracy make for one of the most potent and liberating achievements of the period following the French revolution. Yet what cripples liberalism as an emancipatory force is its own contradictions, the four main of which I wish to outline in this essay. Note that I use liberalism in the European sense here, not the American. So when I write liberal I do not mean the often scorned, both from the left as the right, centre-leftists of the United States. But rather the ideology most strongly associated with the liberty part of the French revolutionary slogan: liberté, égalité, fraternité, the ideology of a constitutional representative democracy, with a free-market as its economic counterpart. The first contradiction is the attempt to forcefully separate the political and economic spheres. Liberals see the political sphere as the site of democratic contestation and the rule of law, in contrast to the economic sphere where private initiative and competition reign supreme. To these two might even be added a third sphere: that of the family. Distinguished from the other spheres by the care and cooperation implicit in its privateness, separate from the hard confrontation and competition inherent in public life. A public life reserved for men, in contrast to the private family which would be the domain of the woman. Yet this gendered third sphere has come under increased pressure from women’s participation in the economy and feminist movements, hence my focus on the first two and particularly the attempt to separate them. A prime example of this separation is in the liberal analysis of basically any revolt. They obscure the inherent entanglement of political and economic motives for rebellion in favour of a singular focus upon political reasons for revolt, mainly a mythical desire for freedom and democracy. When the economic does come into play, it is through the perceived rise of a well-to-do middle-class, supposedly more disposed towards liberal democracy. Throughout their analysis they ignore the economic motives underlying collective action. Take for example the Arab Spring: liberal commentators systematically tried to obscure that it was built upon dynamics of protest going back decades in the Middle-East, often to the introduction of liberal economic reforms in the eighties; and that economic actors, such as unions, often fulfilled key roles without which the Arab Spring would never have been possible. Economic struggle, even in its most particularistic form, eventually always transcends its initial origins and becomes political because it involves key political questions about the distribution of wealth in society. Besides that, demanding space for protest, however particularistic, quickly becomes political in an authoritarian regime. This obvious contradiction sends liberal commentators scrambling to rebuild the broken levees they erected between the political and the economic in the aftermath of basically any big revolt. Making for a familiar pattern whenever large scale protests erupt in the non-Western world. This way of thinking represents a key contradiction of liberalism precisely because one of its basic premises is the containment of the use of political principles in the economic sphere. A good example would be the savage attacks by liberals on economic regulation currently taking place all across the world; attacks that aim to reduce the influence of laws protecting workers against the excesses of the free market, and thus political principles in the economic sphere. The previously detailed separation-anguish eventually serves to prevent the extension of the ultimate political principle, namely democracy, into the economic sphere. Which would mean the end of the social groups most inclined towards liberalism, and with them the ideology itself. A second contradiction is the inherent tension between the political programme of liberalism and its economic aspirations. The political programme consisting of civil and political rights guaranteed by a representative democratic state. Its economic programme being one of free-market politics, in which competition between private economic entities is supposed to produce optimal societal results. Yet the political inevitably spills over into the economic. Workers can use the space opened by civil and political rights to organize and limit the capacity of private economic actors to compete with one another. Furthermore the possibilities offered by representative democracy gives workers the space to at least influence policy, again limiting the capacity of the private economic actors to push through their interests. The levees between the political and the economic hardly holding up, and this time the narratives promoted by liberal commentators cannot rebuild them. And when their economic programme is threatened, most liberals choose to give up on their political demands. 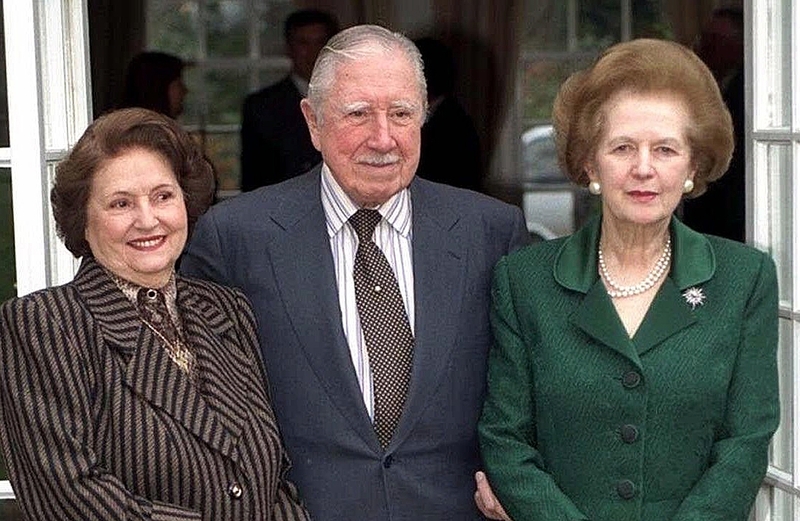 Clearest examples would be the various figures of extremist liberalism, such as Hayek and Thatcher, rallying to the authoritarian regime of Pinochet. Willing to give up their political principles in return for the short-term maintenance of their economic programme, and the possibility of long-term restoration of their political programme. The last one seeming to be relatively peripheral to their economic demands. A third contradiction is the odd tendency for liberals to rely on explicitly anti-liberal forces to enact their policies. Unsurprising seeing that liberal political movements in many countries lack the mass basis of other political families, ironically not making liberals the main force in the spread of liberalism. Committing a liberal sin we can split the economic and political in this regard. The economic programme is generally associated and enacted by actors on the right, often of an authoritarian bend. We have already mentioned liberal support for Pinochet, to which could be added the support of Mises for fascism in Austria. More mundane, and democratic, is the contemporary tendency of liberal and conservative parties to ally. Where during the 19th century these two political families often engaged in a mortal struggle of life and death, it seems that both have found one another in the last century, liberals remaining content in ignoring the fundamentally anti-liberal basis of conservatism while conservatives do the same on their side. Much of this marriage of convenience has been made possible by the adoption of liberal economic policies by conservative political parties, and the necessity of liberal parties to find partners that can actually mobilize large segments of the population. In contrast, and quite amusingly, we can again conclude that most of the liberal political programme has been forced through by anti-liberal forces, yet this time by actors from the left side of the political spectrum. Representative democracy and civil and political rights generally not being the result of liberal agitation. Liberals, particularly in the 19th century, remained content with limited suffrage based on property standards and heavy limitations to civil and political rights for certain excluded populations, not to mention blatant racism and imperialism. Only the mobilisation of these excluded populations, generally under a socialist or left-nationalist banner, managed to achieve an expansion of these rights for an ever growing section of the world population. Generally decades or even centuries after their proclamation, a process still in motion today. Again we can here remind ourselves of the relative disinterest shown by liberals towards their own political programme when faced by their economic interests. In fact most of the history of the left is in a sense the story of the progressive expansion of citizenship rights towards an ever expanding group of people. Liberals having remained largely content in establishing these basic principles of citizenship and then only granting them to a small elite that represented their social base. And where liberals generally supported alliances with non-liberal forces to enact their economic programme, the liberal political programme has precisely been enacted in opposition to liberals of the day. Only afterwards did many of them start claiming these rights as their own, even though their historic counterparts generally opposed granting them. This argument of course could be turned against the left to show how most of the more enduring gains made by them have in essence been rights originally liberal in nature. Rights, however, that had only in a very limited way been championed by liberals themselves. The three previous contradictions are, contrary to what could be expected, not the result of some sort of ideological incoherence on the part of liberals. Rather they derive from a clash between the universal aspirations of liberalism, chasing the liberation of all of humankind through equal participation within a liberal social order, and the class basis upon which liberalism is based and whose interests its proponents defend. This clash makes it so that liberals become the victim of their own, particular, interests, that cannot be reconciled with the liberation of all humankind. This clash contrasts with socialism, whose logic is precisely based upon the possibility of transcending class society and in the process liberating humankind from it. The struggle for the particular interests of the working class being capable of mutating into an agenda for the emancipation of all classes, and thus their elimination. Precisely through extending principles of democracy from the political into the economic sphere, eliminating the artificial distinction between the two. This extension being a logical continuation of the emancipatory promise of liberalism, just as the expansion of citizenship to excluded groups is a logical furtherance of liberal thought. Yet liberalism itself is incapable of making this daring hurdle because of the social classes upon which it is based, mainly the bourgeoisie and their petty counterparts, liberals thus remain incapable of transcending themselves. The working masses,however, are capable of transcending themselves because they are daily confronted with the incapacity of liberalism to extend its principles into all spheres of society. It is thus for these masses to make the daring hurdle, and it is for the left to be at their side when making it. This entry was posted in Bourgeois politics, History, Politics, Proletarian politics. Bookmark the permalink. I’m sorry, but I don’t see why any of these are ‘contradictions’. C1: The political and economic spheres are separated and they are not. C2: There are tensions between the political programme of liberalism and its economic aspirations and there aren’t. But, the ones you cite don’t even look like contradictions (howsoever much we might deplore ‘liberal capitalism’ and want to see the back of it). They are contradictions in the sense that liberalism needs to limit the application of certain principles to certain spheres of society to satisfy the particular needs of its social base. Broader the article is about how liberalism has shown a glimpse of what emancipation could mean but is incapable in serving as the ideology that extends this emancipation to the entire population and all spheres of society. For example liberalism fails to extend its political programme to the entire population and into the economic sphere, thus requiring the ideological separation between the economical and political sphere, or for example the constant othering of certain populations. Of course you could debate the meaning of the word contradiction but I do think the things I pointed to are contradictions. Thanks for that, yeksmesh, but you failed to explain why you want to call these ‘contradictions’. I know it is traditional (among Marxists, and Hegelians, perhaps) to call such things by this word, but I have yet to see a good explanation why this word has been chosen, especially when the sort of things you list don’t even look like contradictions. I have been debating this topic with comrades for well over 25 years, and, as I noted, I have yet to see a convincing explanation for the use of this word (or even so much as a poor explanation) — and this includes debates I have had with Marxist professors and other ‘academic Marxists’. As far as I can see, you have no more reason to call these ‘contradictions’ than you have to call them ‘bananas’. This isn’t just an academic, or pedantic, point; there are political as well as philosophical reasons for objecting to the use of this word to describe such things.